Trident MK2 SPR is designed to be the ideal scout rifle to take into the field. The 16” barrel and 13” free floating DEFIANCE keymod hand guard gives the user numerous customization options. The DEFIANCE hand guard features three prongs at the front that can be used to brace the gun against barricades, eliminating the need for an aftermarket barricade stop rail accessory. The MK2 aluminum receivers feature a modern design style with a stamped KRYTAC logo and include an integrated trigger guard. An originally designed DEFIANCE pistol grip enhances the rifle’s comfort. Additional features include an ambidextrous fire selector and a locking bolt that provides easy access to the KRYTAC rotary hop-up system. The KRYTAC rotary hop-up has 15 adjustment settings and a numbered adjustment wheel for a quick reference point to determine how much hop is needed. At the rear of the SPR is the KRYTAC adjustable battery stock, which features two different battery configurations, nunchuck style batteries can fit in the tubes or a small lithium polymer brick battery can fit at the rear of the stock in front of the buttpad. A third battery option for the Trident MK2 SPR is a stick battery in the buffer tube. The stock also features two QD sling swivel divots as well as a loop for strap type sling attachments. 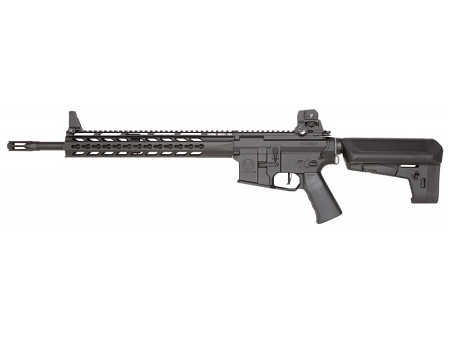 The SPR has the look of a long distance rifle, and it also has the power plant to back it up. Internally, the Trident MK2 SPR features a reinforced 8mm ball bearing gearbox with integrated MOSFET to regulate electronic signals and to protect the trigger contacts. The corners of the gearbox that surround the cylinder feature a smooth radius, as opposed to a 90° angle, to prevent fracture. Also, the gearbox shell features a small window on the left side where lubrication can be applied directly to the gears or piston, this window is also convenient for inspecting the angle of engagement with the gearbox fully assembled. Additional gearbox features include a modular spring guide system that will allow the spring to be changed without completely disassembling the gearbox. The KRYTAC piston is made of a durable, lightweight, and polymer and features 4 metal teeth, with the 2nd to last tooth absent. The Cylinder head is padded with an enlarged rubber bumper to optimize the angle of engagement and to absorb energy form the impact of the piston assembly. The material for the gears have been especially formulated to be very strong. Rockwell test figures on the KRYTAC gears are much higher than industry norms. Turning all of the drive train components is the KRYTAC high torque motor, capable of 30,000 revolutions per minute unloaded.